The Triumph Stag was a two-door, four-seat, luxury touring car, designed to be Triumph's flagship model for the 1970s. Styled by prolific designer Giovanni Michelotti, and engineered by Harry Webster and Spen King, the Stag had no direct competitors throughout its production life and was the blueprint for the many four-seat convertible on the market today. It was in production from 1970 through to 1977, but suffered from a lack of development and gained a reputation for engine problems caused by poor cooling. 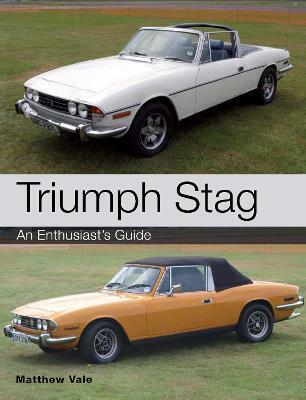 Triumph Stag: An Enthusiast's Guide covers the history, design and development and also gives owners' experiences, specialist modifications and much more.